I had booked the campsite months ago (as you have to do in California) as a romantic getaway weekend for my husband and me, but a last minute work trip for my husband required a change of plans. I asked around and Leslie, Sarah and Laura were not only available, but up for the adventure. Just like that, we had a girls trip. The “Girls Trip” is something I always say I want to do, but somehow never make happen due to limited vacation, limited funds, and/or family obligations. Unfortunately it can get deprioritized. And that’s a shame, because as this weekend proved, Girls Trips are good for the soul. We barreled down the 101 in Sarah’s blue Ford Explorer, reading off our Secret Language of Birthday personality traits and belly laughing at the results: a love of gambling, a perhaps missed career as a scientist, a “dark” side, and a psychic streak. We exchanged stories of past trips, past relationships, and past times. Our first milestone as a group happened in San Jose when we stopped at In & Out. Growing up in the Midwest, Leslie had never been to the iconic chain. “Did it live up to the hype?” We asked. Yes! It did (as we all knew it would). The sun set while we passed through Carmel, and we gave up all hope of setting up camp in the daylight. Despite leaving San Francisco at 1:30pm, peninsula traffic would make a three and a half hour drive a five and a half hour one. Thinking we wouldn’t be able to purchase firewood at the campground due to the ranger leaving at 6:00pm, we stopped at a log-cabin-like convenience store along Highway 1 in Big Sur. Two women sat behind the counter, engrossed in conversation, barely even looking up when we walked in. We glanced around for firewood and found it piled five feet high along the right perimeter of the store. We bought four bundles and grabbed a couple stacks of newspaper from a basket in the corner. While I chatted with the store clerk, the rest of the group looked to see if there was anything else we would need for our trip. “Where you guys stayin?” the woman behind the counter asked me, “Over at Pfieffer Big Sur?” Pfieffer Big Sur is a state park with camping that’s about two minutes down the road from where we stopped. “Kirk Creek Campground actually,” I replied. “All the way down there huh?” she said as she raised her eyebrows in surprise. “All the way down there?” I thought. 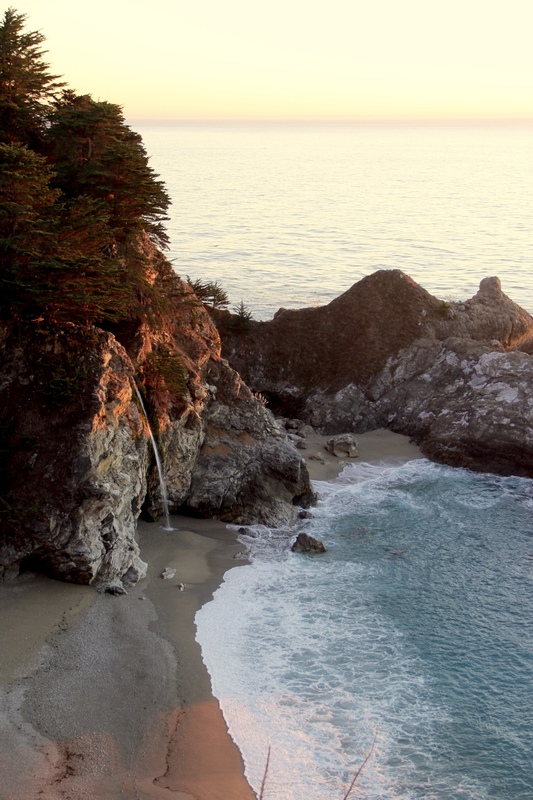 I had been to Big Sur before and knew it couldn’t be further than 30 minutes down the road. “Oh you can reserve those campsites? !” she asked, surprised again. I told her how you can pick your site based on an interactive map on the website and she told me how the campsites used to be more private because jubata grass used to grow there. The parks department removed the grass years ago because it’s a non-native, invasive species. 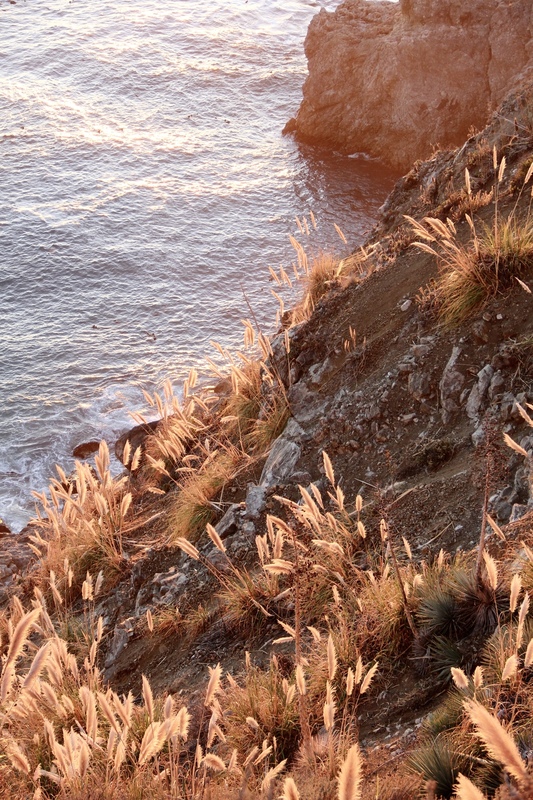 Originally from the the Andes, the grass likely traveled to California through horticulture trade and you can now see it’s feathery plumes dotted all over the Big Sur landscape. The problem is, it crowds out the native species. Two $5.99 headlamps and a handful of poison oak cleanser packets later and we were back on the road. Even without the jubata grass, we felt like our campsite was pretty private for car camping. We couldn’t see the people in any of our neighboring sites and even if we could have we wouldn’t have cared, because we were staring straight up at the sky trying to spot constellations. Sarah got the fire going while the rest of us pitched the tents and pretty soon we were sitting around a warm fire making s’mores. Like any good campfire discussion, we drifted to ghost stories and resolved that if anyone or anything came to get us in the night, we would calmly recite the following: “You are not welcome here, please leave.” That or Sarah would run out with our giant bonfire stir stick. The next day we woke from our peaceful and uninterrupted slumber (thank goodness) and after some delicious eggs, potatoes and coffee headed north on Highway 1 to do some hiking. Our first stop was Limekiln State Park. Unfortunately, all of the hiking trails are closed for maintenance right now, but we did get to meet Bogey, the friendly Basset Hound, so ultimately a worthy stop. 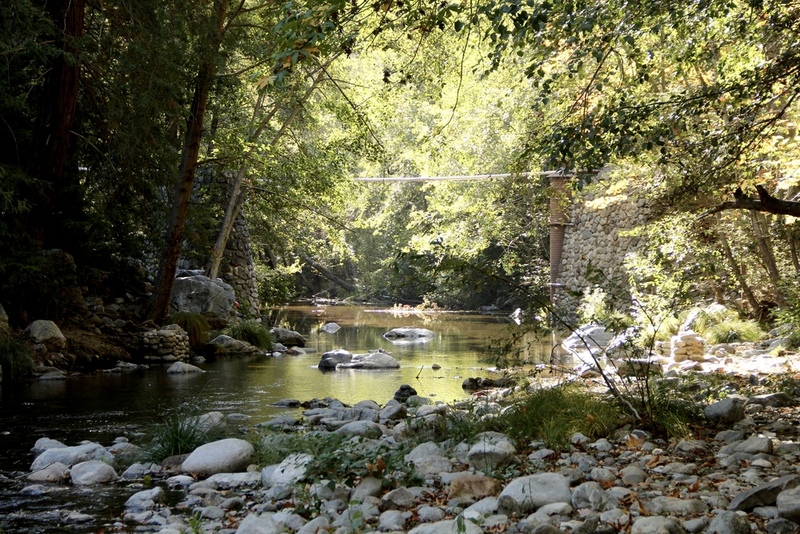 Limekiln also has a beach that you can access by going underneath the Limekiln Creek Bridge. We headed further north, passing Julia Pfieffer Burns State Park (this is better visited in the afternoon when the main attraction, McWay Falls, isn’t bathed in shadows), and pulling into Pfieffer Big Sur State Park. Two miles of hiking later and we saw Pfieffer Falls and a view of the valley from a vista at the end of Valley View Trail. We ate our almond butter and raspberry preserve sandwiches along Gorge Trail next to the Big Sur river. Feeling lazy with the middle of the day upon us, we traveled south to Pfieffer Beach to relax on the sand. We ate olive tapenade and hummus while sipping on Coors Light. Unhindered by cell service, we chatted about life. And as I’m often reminded, get four women together and no matter how old, there will be giggles. We learned about each other, laughed at each other, and after a couple of hours both our hearts and bellies felt full. Sarah even did a couple aerials (a cartwheel without hands for those of us who are less versed in gymnastics terms). 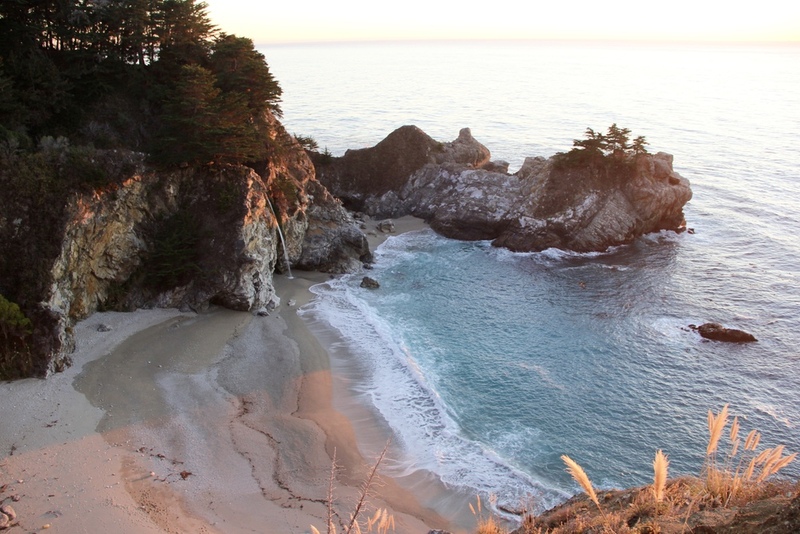 The cherry on top of our great day was hitting McWay Falls at just the right time before sunset and then heading back to camp for more girl time around the campfire with so many s’mores. 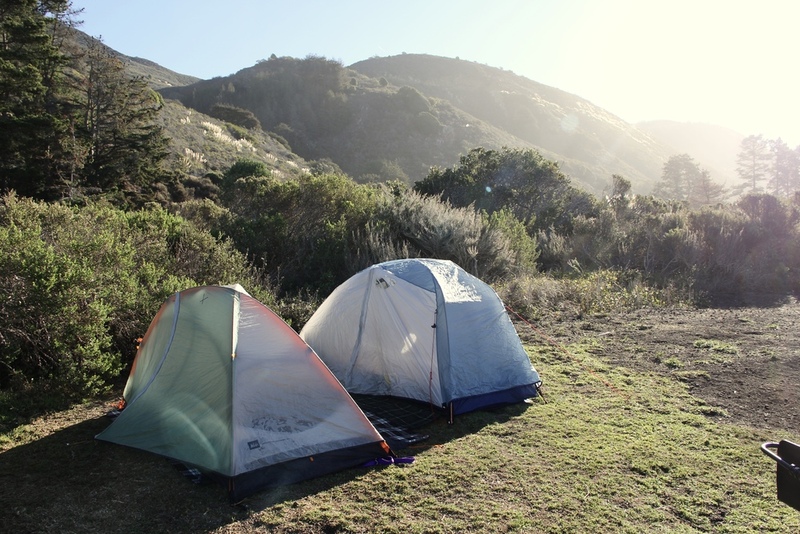 Kirk Creek Campground | Views of the ocean, fall asleep to the sound of the waves. Firewood can be purchased at the campsite for $8/bundle (payment based on honor system of putting your dollars in a wooden box). We recommend the hike in sites for the most privacy. No showers, compostable toilets.